At a 10:00 am special City Council meeting today, newly elected council members Suzanne Jones, Lisa Morzel, Tim Plass, George Karakehian, and Ken Wilson were sworn in at City Council chambers. Once the new council was seated, sitting Deputy Mayor Ken Wilson presided over deliberations for new leadership through a nomination and voting process. For Mayor, George Karakehian nominated Suzy Ageton and Macon Cowles nominated Matt Appelbaum. Appelbaum was elected on a 5-4 vote with support from Macon Cowles, Tim Plass, Suzanne Jones, Matt Appelbaum, and Lisa Morzel. For Deputy Mayor, Suzy Ageton nominated George Karakehian and Macon Cowles nominated Lisa Morzel, who won on a 5-4 vote with the same supporters as Appelbaum. 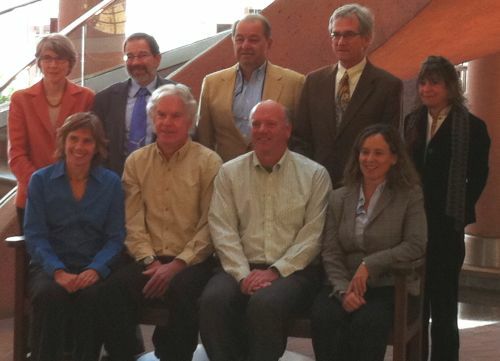 The first meeting of the new council is at 6 pm tonight (Tuesday 11/15/11).